My husband left for Fort Campbell yesterday morning at about 2am for a few weeks of training. A fly on the wall would know this without it even being announced. How so you might ask? At 10am my washing machine stopped spinning. It filled; it washed; but when it came to the draining part, it stopped. I took all the sopping wet laundry out (which of course it was a bleach load), used an old fish tank "syphon" to take out the water and then I did the scariest part of it all, I grabbed the tools out of the garage. Actually, I wasn't so scared... It would be Paul who gets shivers up his spine every time I even touch a hammer, much more a screw driver. Those tools are his domain. He likes being "the man of the house" and is afraid of the damage I might cause, even the slightest most unnecessary dent I might put in the wall. 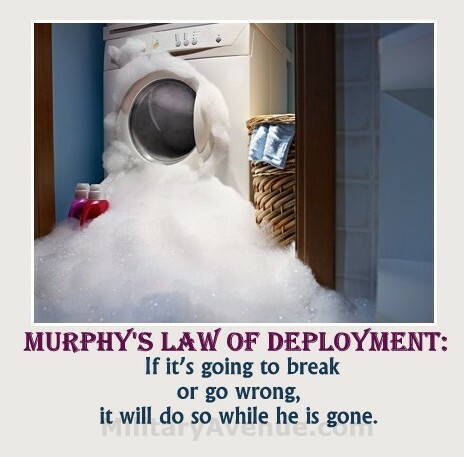 So this training-exercise, followed by his deployment will be a growing experience for him as I report things like the cool little shelf I hung up; the bathroom I repainted; the washing machine I fixed. Well, I sort of fixed the washing machine, more like I found the problem. We have a little hook that locks the door so that it can't be opened in the spin cycle. Apparently, it is not moving over when it needs to and so the machine doesn't know to drain. If I manually bring it over and hold it it drains and spins just like it should. Of course that involves standing there for the entire 5 minute spin cycle. I called Paul later in the evening to tell him about the washing machine and that I figured out the problem. I could almost hear his brain rattling. How was he supposed to react? Scared stiff that I took the front panel of the washing machine off with a screwdriver? Upset that he couldn't be there to do it himself? No, in fact, he was proud of me. I could hear the smile on his face. This of course would be a logical response from me. I'm always happy when he fixes something. His father's ability to be an all-around handyman seemed to have skipped Paul's genes. But I know him. I know it wasn't easy for him to be happy I actually used a screw driver, as opposed to calling a neighbor and asking for help. We will grow. We may be a part from each other over the next year but there are many ways that I know we will grow closer. I may not look forward to our time apart but I do look forward to always loving him. PS... MilitaryAvenue.com has many categories of military-friendly businesses, including "Service Contractors". If you are in need of household repairs and can't figure it out on your own then find your installation and click on "Home & Garden" on the left. Service Contractors & many other related military-friendly businesses are listed for your convenience. What about neighbors that want to help out. Have you looked into any local support programs? Church? That is a great point! It is wonderful to have neighbors and other support units. If my 'washing machine skills' had failed me I know of a number of neighbors that I could have turned to. Isn't it wonderful to know we don't have to do it all on our own! I agree with you 100! Amazing the strength we military wives can find when put to the test. The picture took me back a few years.... my washer was not as fancy... and then, I remember the dish washer spewing bubbles up to my eyeballs. Life! We get to live it to the fullest, don't we?!?!?? !